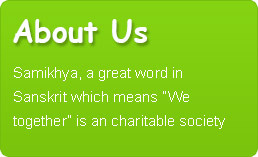 Samikhya Charitable society , a non profit organization which aimed towards children welfare as THE PERKS OF PUREST HEARTS to come up with "Project Smiles".Although SCS has intented towards multiple charity actvities, Project Smiles is the proud legacy that SCS promotes for child education. As the saying "vasudhaika kutumbakam " our aim is to unite all as one family. The love and affection must not only be shared towards the welfare of our families but also to the entire society by treating it as our family. And a family starts with a child. Because " SMILES - Every child's hope , every parent's wish and samikhya's vision "
Samikhya certainly believes Education as the main weapon in achieving social/economic equality. In a country like India rightly speaking situation is such that rich are becoming richer and poor getting deprived of their basic amenities. Such is the prevailing situation of the inequalities in India. Children of these deprived / weaker sections are not getting a proper opportunity to get into good institutes due to their financial inability and their talent is getting wasted. When a legend like Mr.A.P.J.Abdul Kalam who hail from an ordinary background can become the President of India, it is quite obvious to expect a few more to achieve great heights from the same back ground. Even today education is far beyond the reach of many ordinary and poor families which is really a matter of concern for a developing country like India. Samikhya strives to reach those students who are financially backward and facing problems to continue their education,we support them financially and technically to continue their education.